This vessel served as the lifeboat at Arklow, Southern Ireland, from 1938 until 1968. She was launched eighty-seven times, saving ninety-eight lives. She then became part of the relief fleet and, in that guise, took twenty-three calls, rescuing forty-two people. ARKLOW was sold out of service circa 1973 by Dickie's at Bangor, North Wales. 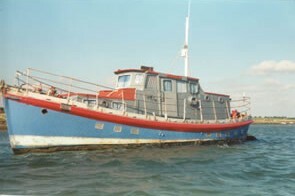 She has subsequently been converted for use as a pleasure craft, with her interior re-fitted in mahogany. New engines and a gearbox have also been put in.